TAMPA, FL — Speaking to supporters in Tampa, Hillary Clinton says climate change is “wreaking havoc on communities across America.” Clinton warns that Hurricane Hermine “is not the last one that’s going to hit Florida given what’s happening in the climate.” She says, “When it comes to protecting our country against natural disasters and the threat of climate change, once again, Donald Trump is totally unfit and unqualified”. Flashback 2014: PROF. ROGER PIELKE JR: TESTIMONY ON THE CURRENT STATE OF WEATHER EXTREMES: ‘It is misleading, and just plain incorrect, to claim that disasters associated with hurricanes, tornadoes, floods or droughts have increased on climate timescales either in the United States or globally’ — Link to full testimony of Roger Pielke Jr. to Congress: ‘It is further incorrect to associate the increasing costs of disasters with the emission of greenhouse gases’ Globally, weather-related losses ($) have not increased since 1990 as a proportion of GDP (they have actually decreased by about 25%) and insured catastrophe losses have not increased as a proportion of GDP since 1960. 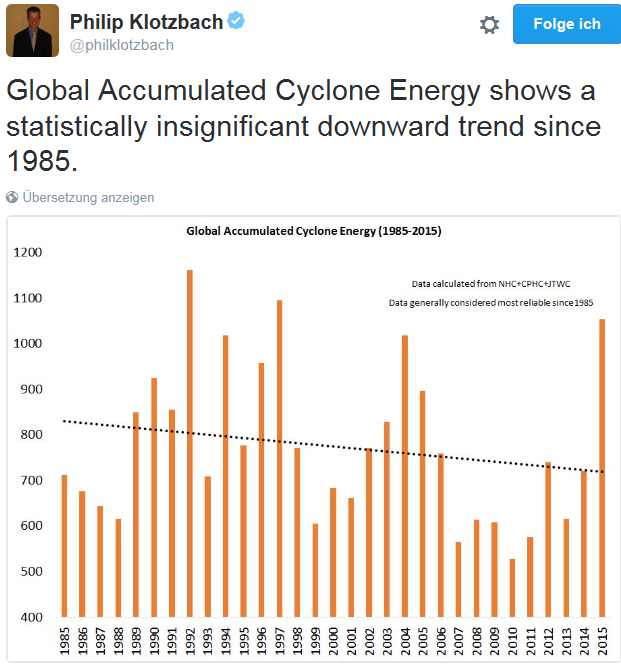 • Hurricanes have not increased in the US in frequency, intensity or normalized damage since at least 1900. The same holds for tropical cyclones globally since at least 1970 (when data allows for a global perspective).